As students in public schools, they have a first amendment right to peacefully express their views about the LGBT community, and GLAD has the tools to help students in those hard situations. Despite the threats and the public shaming (even from teachers, who docked participation grades for those choosing to be silent) there were still some who proudly let their silence speak volumes for their community and for themselves. My senior year, I finally decided to join them. Though I was not out to myself yet, on that day I was silent for my brother. As the Day of Silence is in its 19th year, originating at the University of Virginia in response to a class assignment on non-violent protests with over 150 participants, I am reminded that my experience is not unique. There have been countless studies on these issues to date confirming what students see every day in their classrooms, that LGBTQ students are not only silenced, but are disproportionately punished for being themselves when they enter their schools. It’s Not Your Imagination: LGBTQ Youth Are Disproportionately Punished in School from GLAD’s Youth Initiative Director Vickie Henry and GLAD Legal Assistant Michelle Wiener, outlines a number of these statistics and sources showing the unsettling truth about how hard it is to be an LGBTQ student in the modern climate of education. 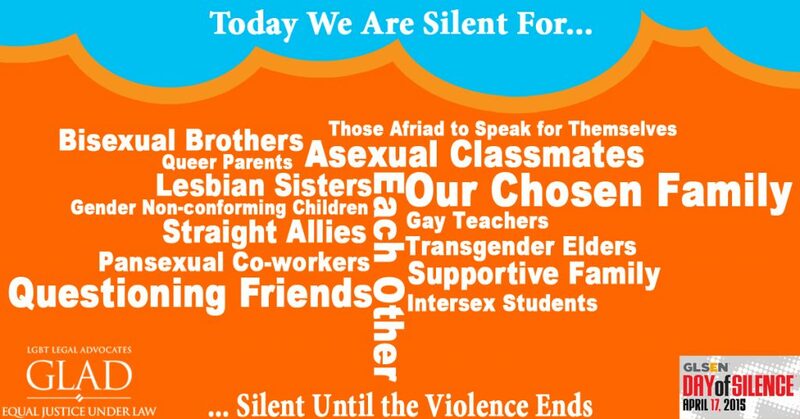 Since the Gay, Lesbian & Straight Education Network (GLSEN) became the official organizational sponsor of the Day of Silence in 2001 it has reached students from around the world. In 2014 GLSEN reported that there were participants from schools in America, New Zealand, Russia, Singapore, and many more in between. The Day of Silence is now one of the largest student-led actions in the United States. Beyond organizing the Day of Silence, GLSEN continues to report on the climate of schools in America and works to further educate people on the issues that are so actively oppressing LGBTQ students. 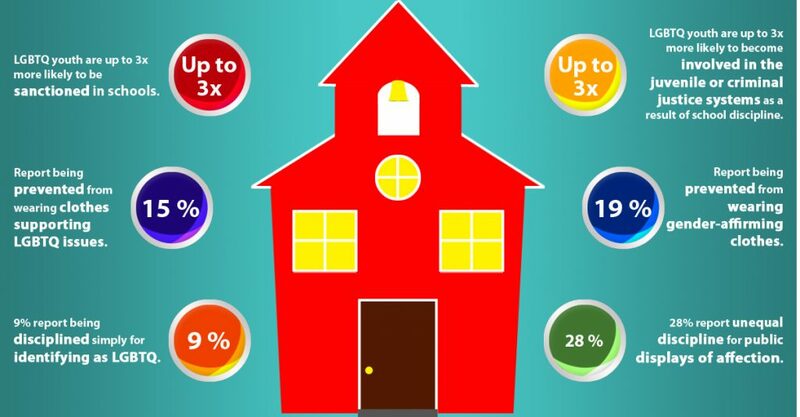 The 2013 National School Climate Survey they produced reports on a number of issues including hearing biased language, experiences of harassment and assault, anti-LGBT discrimination at school, availability and impact of supportive school resources, and many more important statistics that schools across the nation should be aware of. Below is a short introduction on what the climate survey has found. An important start to altering the climate of schools lies in the establishment of Gay-Straight Alliances (GSAs) and other LGBTQ clubs. GLAD is committed to helping youth achieve just that, with our ongoing initiative to get students the support and the information they need. Below is our video outlining a few of the basic steps in starting a GSA, and we can always be reached through our GLAD Answers information service, staffed by volunteers dedicated to educating LGBTQ people in the New England States on their rights. If a student you know is having trouble getting support from their school to participate in the Day of Silence, please have them contact GLAD Answers! As students in public schools, they have a first amendment right to peacefully express their views about the LGBT community, and GLAD has the tools to help students in those hard situations. On the Day of Silence in 2010, I was silent for my brother six years my senior, who was braver than I had ever been to be gay, proud, and not let the world he was subjected to shake him. Today we are silent for our brothers, sisters, gender non-conforming, and transgender siblings in this movement; for our chosen family; for our elders, and their courage to be who they are unapologetically. We are silent for each other, we are silent for our classmates, we are silent for our students, and optimistic that we are getting closer to ending the violence and punishment they endure as LGBTQ youth, one day at a time.